Do You Want to Make Peace With Your Eating Problems? declare peace with your emotional eating problems. French Toast for Breakfast has been described as a warm and compassionate guide. 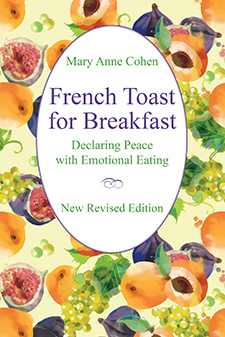 Clearly written for people with compulsive eating, chronic dieting, bulimia, and anorexia, French Toast for Breakfast will help readers come to see food as their friend and nourisher, not their enemy. This book is filled with dialogues from actual therapy sessions, an in-depth comparison of treatment options, and an exploration of how to resolve the obstacles to success. French Toast for Breakfast also looks at relapse, how to prevent it, and what to do if it occurs. It also includes a unique questionnaire to help readers determine which path to peace is best for them. 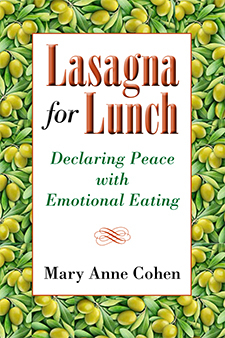 My new book, Lasagna for Lunch, chronicles my experiences as an eating disorder therapist over the past forty years. This book is an intimate account of what goes on behind the scenes between client and therapist to resolve emotional eating. A person’s eating disorder is a creative solution to inner turmoil. The therapist helps expand the creativity of the client to find solutions that are emotionally nurturing, not hurtful. Every patient’s needs in therapy are special and personal. The thrust of this book is to explore the ways our relationships with ourselves and others can go awry and lead us to conclude that trusting food is safer than trusting people. I also discuss how the relationship with an empathic therapist can help us find the path back to healing, health, and wholeness.